Engaging, Sophisticated and Confidence-inspiring, the All New Mazda CX-9 is the newest incarnation of Mazda’s KODO —Soul of Motion design. It athletic posture is as much a joy to look at as it is to drive. 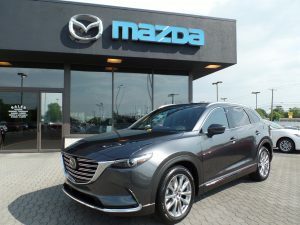 The all-new Mazda CX-9 midsize crossover SUV is evidenced of Mazda’s commitment to the driving enthusiast , earning a spot on Car and Driver magazine’s first-annual 10Best Trucks and SUVs list. CX-9 has been lauded for its upscale design, rewarding and surefooted driving performance and innovative engineering. It is the final vehicle in Mazda’s lineup to undergo a full redesign, implementing lightweight, efficient SKYACTIV Technology and KODO—Soul of Motion design. The All New Mazda CX-9 utilizes SKYACTIV®-Technology and achieves a 25-percent improvement in combined EPA-estimated fuel economy versus its predecessor. CX-9 puts power to the ground via its predictive i-ACTIV® all-wheel-drive system that can adjust power output to each wheel more than 200 times per second to maintain optimum grip. Mazda’s i-ACTIV® all-wheel drive integrates 27 sensors—including thermometers, wheel sensors and even windshield wipers—to accurately paint a picture of road conditions to make sure the driver and passengers feel surefooted even when road conditions become sub-optimal.